The twenty-two-orbit flight of Faith 7 / MA-9, by Gordon Cooper, marked the triumphant final flight of the Mercury Program. Gordon Cooper had been stationed at Muchea during (and in the long run up to) Friendship 7 / MA-6. The recordings below, made at Muchea, have two channels – the Left channel is the Goddard Loop, and the Right Channel is Air/Ground communications. Pass 2, acquired at around 02:22:00 GET (11:26pm West Australian Standard Time on Wednesday May 15, 1963). Muchea Station Director Lewis Wainwright adds a voice note that this is Pass 2, with acquisition at 26 minutes past 11, local time. Surgeon is Aeromed (Royal Australian Air Force) Dr. Warren Bishop. Muchea Systems is apparently Harold (Hal) B. Stenfors, a member of the NASA flight control team. Cape Flight is Chris Kraft, at Cape Canaveral. For recollections of Gordon Cooper’s friendship with Warren Bishop, hear Part 4 the interview with Kevyn Westbrook, Muchea’s GCC (Ground Communications Controller). Pass 2 recorded at Muchea. 00:50 Capcom reports Muchea has TM solid (i.e. stable telemetry downlink). 05:53 Woomera (Red Lake) has acquisition. Pass 3, acquired at 03:58:35 GET (01:01am West Australian Standard Time on Thursday May 16, 1963). Muchea Station Director Lewis Wainwright adds a voice note that this is Pass 3, with acquisition at 1 minute past 1, local time. The recording starts about 2 minutes before acquisition. Pass 3 recorded at Muchea. 03:02 Capcom asks Cooper if the beacon deployed. Yes, but he can’t see it. 04:17 Cooper: Everything is nominal. A 1/4 inch open reel tape of air/ground audio recorded at Muchea was deposited with the National Archives of Australia some time after the mission. A record indicating the existence of the tape (which had not been examined) was found in 2014 by Brian Larwood, who requested a copy of the audio from the NAA. The tape was digitised by Pro Copy in Perth for the NAA in late 2015. Speed correction, editing and identification by Colin Mackellar, January 2017. The tape contains Passes 2 and 3 over Muchea of Faith 7. 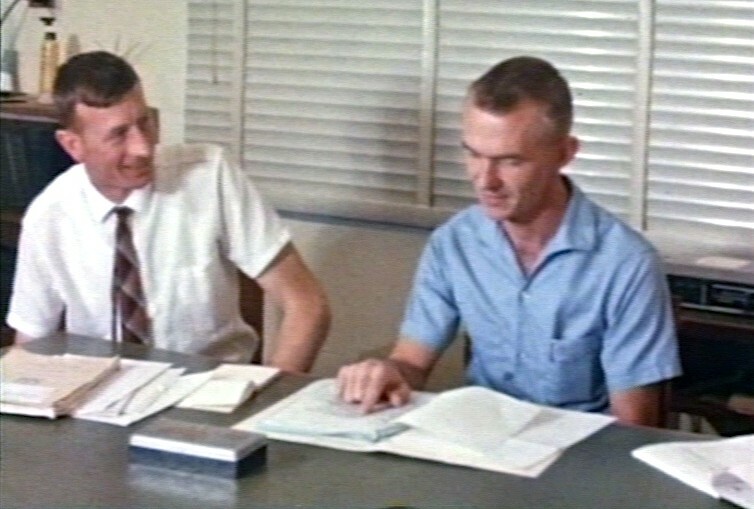 In 1966, three years after the MA-9 mission, Capcom Chuck Lewis (right) spent time at Carnarvon. 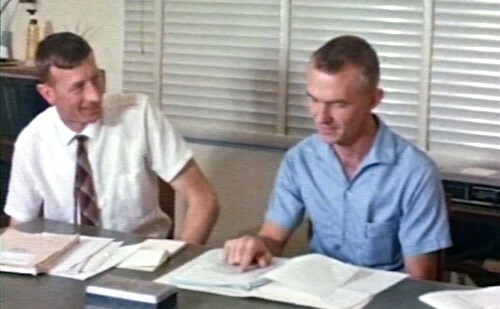 He is seen here with Station Director Lewis Wainwright, formerly Station Director at Muchea. From a frame of 16mm Department of Supply footage. Back to the main Muchea page.